Do you want to know how to get to the songtan (station)? There are many ways you can get to songtan (station) such as public transportation (bus, subway / metro), taxi and Blacklink limo/transfer/shuttle service. Don't sweat outside waiting for other transportation with your luggage. Make a round trip reservation with Blacklink as you plan for your trip. It is easy, convenient and available 24/7. Then, the assigned Blacklink driver will greet you at the arrival and will drive you to the songtan (station). You can use Blacklink for not only hotel but also Gimpo Airport (GMP), Myeongdong, Jongno-gu, guesthouse, resort, airbnb, lodging and anywhere you want to go in Korea. Check out Blacklink customer review posted below. Songtan continues to grow southward and eastward from the base and is now a major bedroom community for Seoul and Suwon workers. Hundreds of large multi-story apartment buildings house these commuters. Farther away from the base, Songtan appears as any other city in Gyeonggi-do, with high-rise apartments stretching to the south. Cityscape gives way to rural farmlands immediately west and about two miles east of the base. From the downtown bus station, buses run to Seoul, which is roughly 45 minutes north. In 2005 the subway/train line from Seoul connected to Cheonan, with a station in Songtan. Songtan connects to many other cities: Osan, Suwon, and Seoul to the north; and Pyeongtaek, Cheonan, and Daejeon to the south. There is a sizable foreign population; American military, Filipino and, before 9/11 Russian, reside in the immediate vicinity of the base with an increasing Chinese presence of small merchants. Sinjang Shopping Mall Immediately outside the base is a district with many bars, dance clubs, small shops, relator's offices and restaurants. This area is commonly referred to by foreigners as "downtown" or "the Ville" but is officially known as Sinjang-dong Shopping Mall. On weekends the streets are crowded with local residents, tourists, shoppers, military members (U.S and R.O.K.) and general partiers clogging the streets and enjoying the "festive" atmosphere. Famous for hostesses called "Juicy girls" who supply drinks to the customers, most downtown bars feature pool, darts, loud American music (mainly hip-hop, rock, and classic rock) and hookahs as the main attractions. Dart and pool leagues are somewhat popular among the military population. There is a growing music scene at bars that have local bands play on weekend nights. 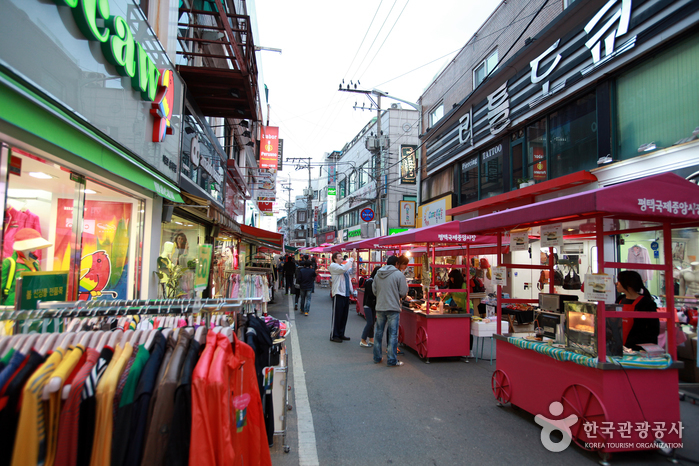 Small shops are a large part of the Shinjang area. 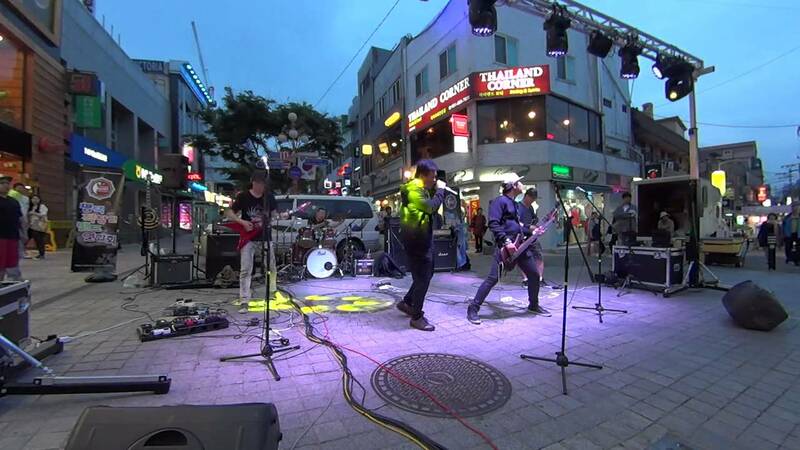 In 1996 a portion of the main street leading off Osan AB was remade into a pedestrian mall, the Shinjang Shopping Mall. Some Americans are eager to buy custom-made clothing at prices somewhat cheaper than in the U.S. from the skilled artisans who line the mall. There are also leather workers and painters, hanji, traditional Korean souvenirs, and blanket shops which cater to the Americans. Customers may haggle with the shop owners to obtain the best deal, and the shop owners are usually willing to do the same. Some of the businesses are well-known food chains like McDonald's, Popeyes and Baskin-Robbins; however, most are small, individually owned shops, restaurants, and bars. Lining the middle of the pedestrian mall and streets are pojangmacha (small tents and carts) offering traditional Korean street foods such as hotteok, tteokbokki, mandu, and dakkochi (skewered chicken) better known in the area as chicken-on-a-stick. There are also small vendor tables selling colorful socks, hats, masks, tee-shirts, and other items and 'gray-market' tents selling copied DVDs. Sinjang-dong Shopping Mall is unique from many shopping strips in Korea because of its relatively large American/foreign presence. Thus, most stores, restaurants, and establishments are bilingual (English/Korean) and many accept US dollars as well as South Korean won. Before June 2013 Sinjang-dong Shopping Mall was known as a seedy collection of "Juicy" bars that catered exclusively to American military. It was filled with Filipina and, in smaller numbers, Russian and Korean "Juicy" girls who worked as hostesses or dancers in bars to provide company and, in some cases, sexual services to patrons in exchange for the patron buying the girl juice drinks priced 10,000 won and higher. Following a crack-down by United States Air Force Korea (USFK) officials, those establishments that got out of the juicy bar business have remade themselves into dance clubs and sports bars. Some are thriving, but some have closed as the 140 bars in Songtan battle for the patronage of area servicemen. Those that chose to remain in the Juicy bar business have been placed off limits to military personnel. The military authorities have no jurisdiction over the private businesses off base. However, they can order the service members under their jurisdiction to not do business with those who do not meet particular standards. Being put off limits can mean that a business loses nearly all of its customers, so many owners begrudgingly comply with the base's requirements. Many owners have complained that essentially this gives the US military de facto authority over the Korean businesses. Song's Plaques and Coins shop in the Sinjang Shopping Mall supplies a large portion of the challenge coins used throughout the US military.